It’s that time again. School is right around the corner. And if you haven’t started making financial preparations, it’s not too late. It’s time to tie up those loose ends and make sure that your next year of college is your best. By getting your ducks in a row now you can stress less about money and instead focus on the opportunities that will help you beef up your resume and build your network. Here are five financial preparations you should make for the upcoming school year. First things first. If you haven’t already filled out the FASFA, you should do so now. Also be sure that your other funding, like scholarships and student loans, are in place. If your student loans are confusing, you be sure to read The Definitive Guide to Student Loan Debt. This guide will walk you through everything you need to know about student loans, from what type to get to repaying them after graduation. College is expensive, but with creativity you can mitigate your costs. There’s no need to take out thousands in extra student loans — instead you should create and stick to a budget. I think we can all agree that one of the biggest pains of college is the insane price of textbooks. I used to faint at the prices. Seriously, $100+ for a book you’ll use for a few months. No thanks. Instead of shelling out a boatload of cash for brand new books, look for used. You can check out Amazon’s textbook service where you can purchase used books and then sell them back when you’re done. There are some substantial savings by doing this one thing. When heading back to school, there are several essentials you’re going to need. (Check out this post for more.) Make sure you do your homework so that you can reap maximum savings. The “must-have” tech items seem to be constantly changing. Instead of buying into the hype, you need to go for items that will last you throughout your entire college career. Look for quality and use the fact that you’re a student to your advantage. For instance, you can get good deals through the Sony Education Store just for being a student. You’ll find discounts on notebooks, tablets, video recorders, voice recorders, plus more. Do your research and look for discounts. They’re out there everywhere! Now we’re on to the fun stuff: earning money instead of spending it. I know you’re super busy with school, but that does not mean that you can’t work as well. In fact, there are plenty of people who worked their entire way through college, and if you wanted to you could do the same. However, I totally get it if you just want to pick up some part-time hours while you hit the books hard. There’s no shame in that! Decide what kind of work you want to do and go for it. You can line up work at your university, get a part-time job off campus, freelance, or even start your own business. Choose an income-earning opportunity that coincides with your goals and schedule. 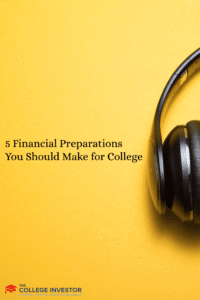 If you haven’t already made all of these financial preparations for college, go ahead and get them crossed off your list. You’ll feel so much better when you can turn your focus onto your studies and stop worrying about money. What other financial preparations do college students need to make for the upcoming school year?